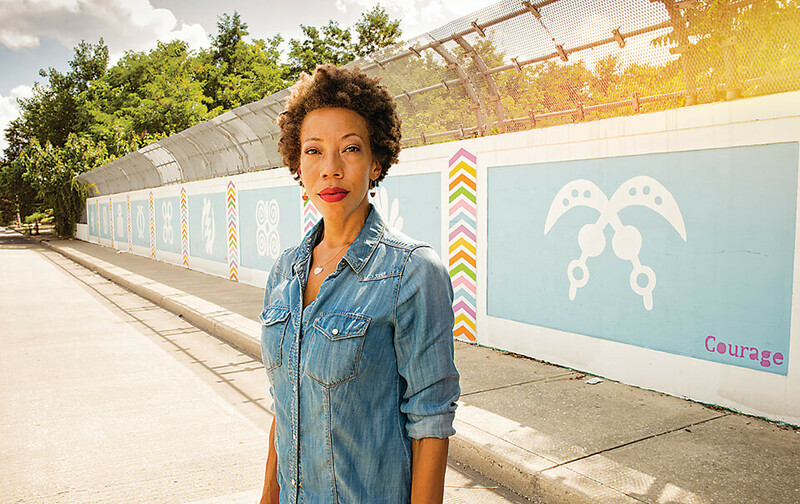 Amy Sherald finds success and a new chance at life. The National Portrait Gallery is quiet on this Friday morning as a group of visitors makes its way to the third floor. In a dimly lit, sprawling gallery, past the Louis Comfort Tiffany windows and Thomas Hart Benton oils, they peruse the portraits—mostly photographs, though there are paintings and sculptures, too, all finalists in this year’s Outwin Boochever Portrait Competition. Some of the works are large and take up an entire wall. Others are small and intimate. 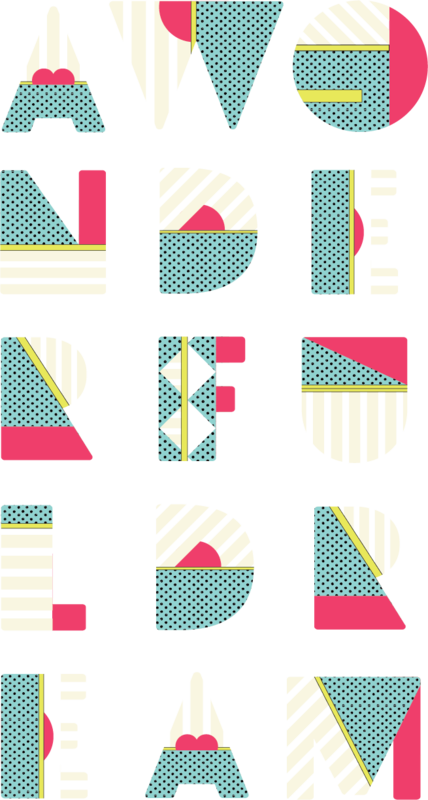 They depict all ages, body types, and ethnicities. But one in particular stands out. She’s the woman in the navy polka dot dress. You can’t help but notice her, as she’s painted against a sky-blue background, staring out at you from the canvas with a determined look on her face. Her name is Miss Everything (Unsuppressed Deliverance) and when you get up close, she surprises you. Her face has African-American features, yet at this distance, you realize she’s painted in shades of gray—hues that exist outside the colors identified with race—and the blue background she stands against is textured with flecks of purple and red. But the most eye-catching elements, regardless of your distance, are the enormous red flower perched on her head and the absurdly large white teacup and saucer she holds in her white-gloved hands. A voice asks everyone to gather, and the members of the media who make up today’s group carry cameras and recording equipment to an open space, where the National Portrait Gallery’s director, Kim Sajet, and the competition exhibit’s curator, Dorothy Moss, stand at a podium alongside some of the artists. 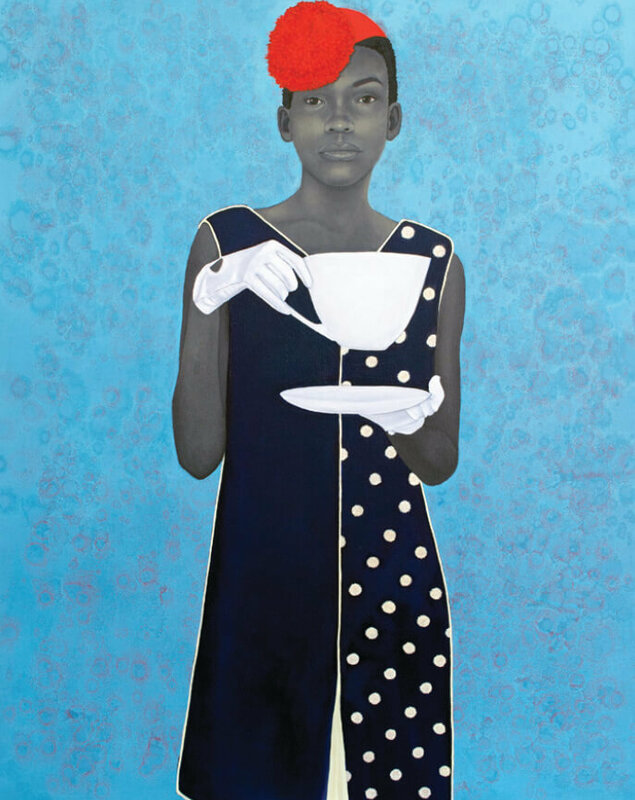 After a few words of thanks, they announce the winner of the $25,000 prize and an opportunity to create a portrait of a living person for the museum’s permanent collection: “Amy Sherald of Baltimore, Maryland”—the painter of Miss Everything. They turn to look at the woman, who smiles slightly, without showing her teeth, as if she hasn’t quite realized that she now has the attention of the whole room. She is wearing a camel-colored cape and black pants that graze her ankles. But the most eye-catching parts of her outfit are the red, Saucony tennis shoes on her feet that match her bright red fingernails, and that mirror the bold, whimsical air of her painting’s subject. Afterward, she is swept up in a wave of congratulators and interviewers. When she can take a break, Sherald steps into an alcove where a video screen plays footage of the judges discussing the competition. Miss Everything was one of the portraits “that really stood out,” Helen Molesworth says in the video. Chief curator of The Museum of Contemporary Art in Los Angeles, Molesworth goes on to discuss the teacup—which, in a way, makes you forget about identifying Miss Everything as a real-life character. “It’s a very realistic painting in one way, yet the details are all quite surreal,” she says. “And the figure is very self-possessed and confident. A kind of, ‘I will stand here and wait until the world catches up.’” Another juror, photographer and professor Dawoud Bey, who happens to be in attendance today and has been peering over Sherald’s shoulder at the video screen, remarks, “I agree, a very striking painting.” At hearing those words, the until now stoic, self-possessed Sherald exclaims, “Ah!” and puts her head in her hands. The reality of the day’s event is sinking in. Amy isn’t the only Sherald holding court at the Smithsonian museum today. Her mother, Geraldine Sherald, a tiny woman with a big presence, tells Moss, Sajet, and a gaggle of National Portrait Gallery staffers who encircle her as if she was the queen mother, “Amy called and said, ‘Mom, it’s the most important day of my life, you’ve got to be here.’” The ladies all smile ebulliently, squeeze Mrs. Sherald’s arm, and then insist on taking selfies with her. Amy Sherald by the mural on a West Baltimore bridge that she helped several teens paint. Four months after that momentous day, Sherald sits in her combined studio/living space at Highlandtown’s Creative Alliance, gazing at the walls. At one point this year, they were covered with the vibrant blues, yellows, and pinks of her portraits, but just recently those works were shipped off to an exhibit in Chicago and all of them sold. Now, the walls are the bright white of a just-rented apartment. Such is the paradoxical life of a successful artist. Barefoot, in a black tank top and jean shorts, Sherald ponders that piece of her identity. Since the Outwin Boochever prize, and really for the last five years, her career has been on an upswing. She’s booked a show in New York for the spring of 2017, and has a waiting list for about 20 paintings following the sold-out show entitled A Wonderful Dream at the Monique Meloche Gallery in Chicago. Her work is in collections at museums like the National Museum of Women in the Arts and the Smithsonian’s National Museum of African-American History & Culture. She’s been featured by The Huffington Post, the BBC, and The Washington Post, and this latest prize is an addition to a growing list of awards. That’s particularly the case because three years ago, Sherald’s life could easily have ended. Diagnosed with heart failure as an adult, she underwent a heart transplant and gained a new lease on life. But it was also the start of an at times difficult journey that is still continuing. Sherald feels the lingering effects of depression and anxiety, conditions that are known to follow heart transplants, and this has changed her personality slightly, she says. She is half joking. One-on-one, Sherald is funny, youthfully joyful and sassy, without losing thoughtfulness, and she seems to find humor and levity in every situation. But you can feel that there is sincerity in what she says. She folds her long legs under her on the couch with a tinge of vulnerability. “It’s scary,” she says. Though she’s always been naturally drawn to art—she remembers doing small drawings at the end of sentences in her notebooks during second grade in Columbus, Georgia—it wasn’t seen as a viable option in her well-educated family. “My father wanted me to be a dentist like him, or any doctor, really. There was this attitude of, ‘The civil rights movement was not about you being an artist,’” she says. 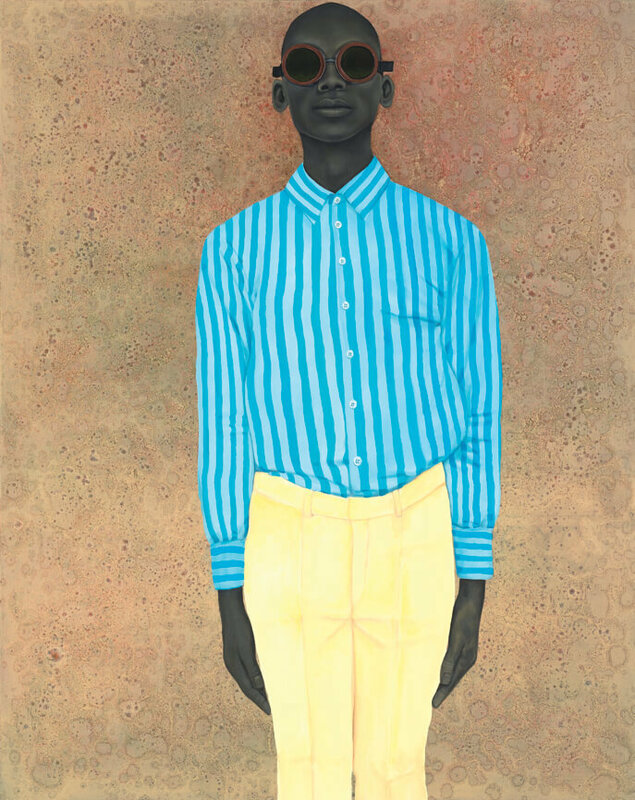 Still, she remembers first recognizing art’s transformative power when, while on a school trip to the Columbus Museum, she saw a painting by realistic portrait artist Bo Bartlett that included the image of a black man. and Miss Everything (Unsuppressed Deliverance). Sherald’s works, from top, Well Prepared and Maladjusted, The Boy With No Past, and Miss Everything (Unsuppressed Deliverance). Already deep in self-discovery mode, Sherald’s world changed direction when she was a sophomore at Clark Atlanta University. After giving the premed track a try and worrying that she might lose her talent if she didn’t use it, she changed her major to art. She enrolled in a painting class at Spelman College—part of a consortium that includes Clark Atlanta—with the man who would become her mentor, Panama-born artist Arturo Lindsay, whose work focuses on the African influence on the cultures of the Americas. He opened her eyes to what it was like to be a living artist, and she knew she could learn from him, so after the class was over she asked if she could work for him for free. Sherald worked for Lindsay for the next five years as she finished her undergraduate degree. She helped him prepare canvases, accompanied him on teaching assignments, and traveled with his art to exhibits—sometimes internationally—when his schedule did not permit. After she finished school, she started waiting tables, but she soon realized that graduate school would give her the added instruction and exposure she needed to advance her career. But while Sherald’s art world was expanding, a visit to the doctor put everything into perspective. In every other way, she was perfectly healthy, and doctors decided to keep a close watch. So, though the threat of heart failure and possibly death loomed, Sherald continued living life, finishing graduate school, traveling to Norway to study with artist Odd Nerdrum, and moving back to Georgia to take care of her mom and two aunts after her father’s death. But she felt the urge to return to Baltimore, to continue the exploration she’d started here. 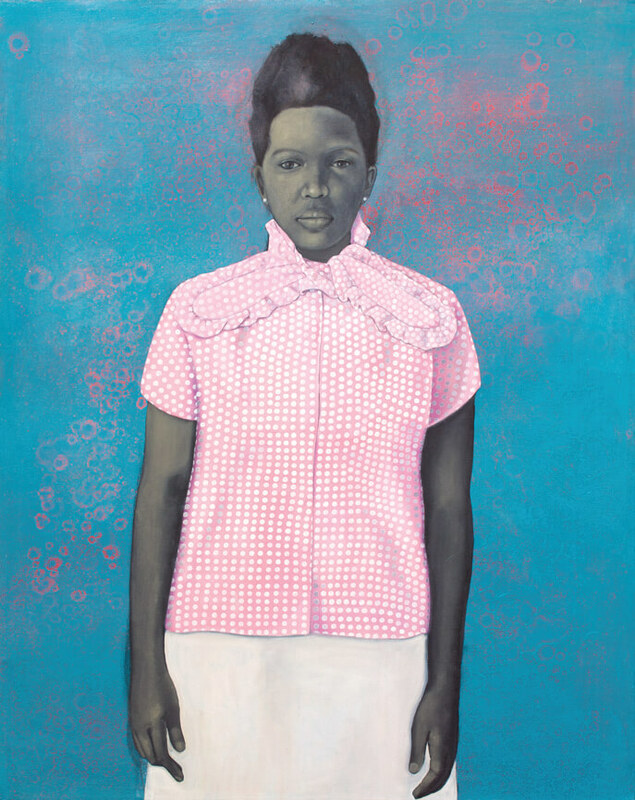 Sherald’s work changed from self-reflective and romanticized into a style in which she emulated old masters and tried to marry that with her experiences as a black woman. “I’d go through all these art books and look at technique, but not necessarily see my story represented,” she says. She also started to analyze her presence in the different atmospheres of Baltimore and Georgia and thought of her own experiences, being from a proud, well-established family—her great-grandfather started the oldest, black-owned business in her hometown. On her canvases, she experimented with capturing that awkwardness of not knowing how to fit in, of having different identities, of being stereotyped, and then blended in elements of fantasy that set her subjects free from stereotypes and constraints of the past. Her first painting that she considers truly successful was her 2008 work, Well Prepared and Maladjusted. In it, a female subject wears an ill-fitting pink checked blouse, buttoned up to her neck, with a too-large bow. Her stiff posture seems to scream how uncomfortable she feels, though her face holds no expression. Sherald’s intention was felt around the country, as the work was selected as a jurors’ pick for the art journal New American Paintings. It has since sold, and it is the one painting Sherald says she will try to buy back if she can. But it wouldn’t be that easy. First, Sherald’s 35-year-old brother, Michael—the one who was mistakenly called her twin because they were so close as children—was diagnosed with Stage 4, nonsmoking lung cancer. Then, while visiting him in the hospital in Georgia, Sherald felt out of breath and tired simply walking from the car to his room. “Okay, something’s wrong,” she thought. At Hopkins, doctors determined that she needed a transplant. They gave her medicine to help her heart beat a little faster and fitted her with a port, which nurses checked on their rounds to see how her heart was functioning. While she played the waiting game for a match, Sherald, as usual, made the most of it, and controlled what she could in an uncontrollable situation. She organized the desk that swiveled on her bed daily, held wine parties in her hospital gown—“I could have a little bit,” she says—and rooted for the patients in surrounding rooms. Friends were constant visitors—like Amato, who served as a stand-in family member while Sherald’s mother and sister were keeping watch over her brother—and many stayed on the pullout couch. Sherald shuffles around her studio, grabbing chocolate for herself and giving a treat to August Wilson, her Pekingese-Jack Russell terrier mix with an adorable under bite who is named for the famous playwright. Upon hearing Sherald’s story, certain items in her living space make more sense—the pill bottles and inhaler that sit on a shelf, for example. Sherald looks down bashfully. “Oh no,” she says, with a slight smile. She’s laughing now. “Whenever I want to be entertained, I talk to you,” she tells Shojaei. Sherald is beaming. She knows that no matter how hard it’s been, and might continue to be, what she’s feeling now is magical.